Part of the fall-inspired MAC Styleseeker Collection that launched online this week (in stores August 23), MAC Hidden Treasure Powder Blush is described by as a "Rich Burnt Red." This is my first blush from MAC so I was clueless on what to expect in terms of finish and pigmentation. The darker color and the lack of any obvious shimmer is what made me pick this, and I am so glad I did! This rich reddish-brown blush has enough pigmentation to show up on my dark skin without making my skin look splotchy or irritated. The blush is a matte finish - at least there's no shimmer or sheen that I could detect - yet it doesn't look dull or flat. Read on for more photos and swatches. In case any of you were wondering on how this compares with the NARS blush Liberte from the summer 2012 collection, here's a comparison photo. I forgot to get the swatches, but I think the photo should give a good enough idea. My photos haven't really done justice to how pigmented MAC Hidden Treasure blush is - I needed only the slightest touch with a stippling blush for this to show up on my darker Indian skin tone! This is easily the most pigmented blush I own. I found it easy enough to blend, and it stayed on the whole day. 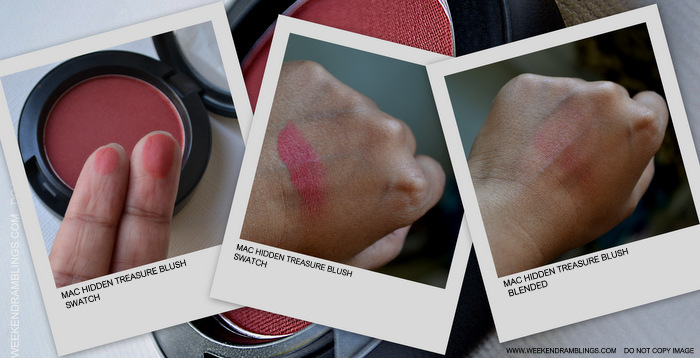 Definitely a must-have blush from MAC, especially for the warmer-toned/dark-skinned people out there. It just launched here online, Preetha..so will take a while to launch in India..but nowadays collections are turning up much sooner, aren't they? I like the color so much Rads :) Suits you very well too. This is such a beautiful blush :) Would be wonderful for fall. Suits you really well Rads. You have a knack for applying blush! I love the fact that it is no shimmer blush!in pan it looks very similar to nars liberte blush. I like the shade ...it look great on you! They are very similar..MAC is a bit darker, though..
Aw youre beautiful Rads. I'm not gonna lie, this blush scares the crap outta me. Not only because of the color but the intense pigmentation too. I prefer a much sheerer blush formula so it's easier for me not to mess up :P looks amazing on you though!